But no adversity shall divert me from my mission, which is–first–to judge you. And second, after the judging… to educate you. 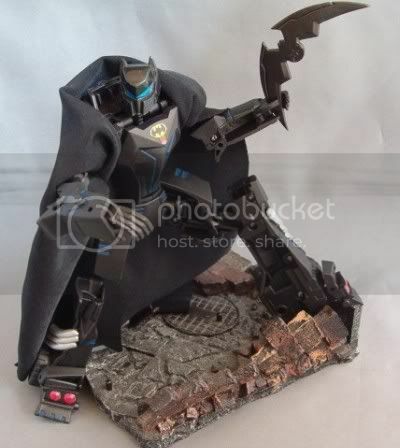 I used the new [Transformers Animated] Lockdown as the base and removed the head completely. 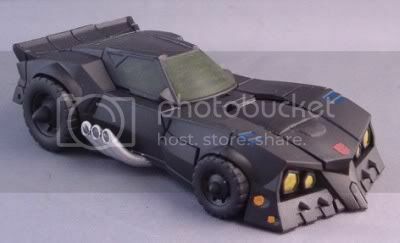 The head is based off of the Nightfall armored Batman. I created a new joint out of a GI Joe missile base and an Armored The Batman figure. I painted the entire figure flat black and the brushed transparent yellow on the window sections to make it look like tinted glass. In bot mode I gave him shiney blue eyes and fixed the hands so they can open the entire way. The cape is cloth and connects under the armpits. For a final touch I filled all lines with blue to give him an energy coursing look. Ah, yes, a fabric cape. Because nothing goes with big, greasy gears on a giant robot like a swatch of fabric. Nothing to go wrong, there. Nope. He totally should have posed the Batman with the Mickey Mouse transformer in a head lock.. I exist to dishearten you, m’dear. SO, no chance of a fluffy bunny transformer here anytime soon? No? How about some pwetty widdle kitty cats?